It's hard being a man in San Francisco. At least according to the men's magazine of choice. Esquire is out with its lists of 27 restaurants where men eat and the Bay Area's representation on the list is less than impressive. It seems David Chang's infamous Momofukugate comments have hurt the reputation of the City that one writer thinks has the best food in the country. The two local representatives on Esquire's list of restaurants that men can believe in: Boulevard and Sam's Grill. Boulevard is recognized for standing out "in the land of locally harvested bulls**t" with its waterfront views and its wood-oven-roasted lamb T-bone. 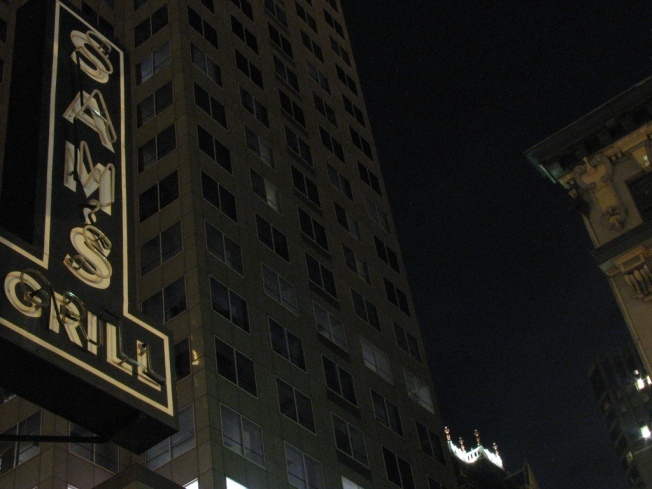 Sam's Grill on the other hand is celebrated for its non-communicative style of operating -- totally a guy thing. Just walk in, expect to be treated rudely, and become a regular to get your own booth. What it must feel like to be a real man in Esquire's world.